As we speak, many of our fellow teachers around the nation are rightfully enraged and taking action against worsening working conditions, increasing demands, unequal pay, large class sizes, and the continued failure by school districts, and ultimately our society, to provide the adequate, equitable, and appropriate resources to ensure that every student can and does achieve. Right now in Oakland, Teachers are facing the specter of school closures and a 30 million dollar budget cut on an already over strapped system. In Los Angeles, teachers have courageously gone on strike to demand better working and schooling conditions. Working under these conditions daily is demoralizing. I have seen teachers crumble under this weight – losing sleep, weakening relationships, experiencing anxiety and panic at work. 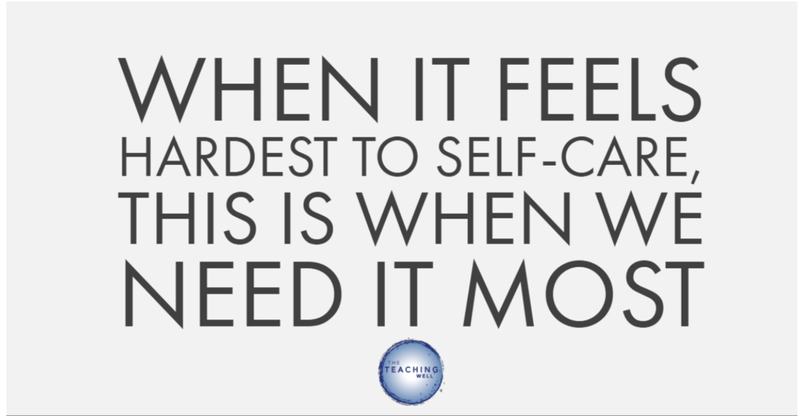 Over time, these experiences drive teachers to quit, and those that stay often numb their pain – either through substances or lessening the amount of “care” they can actually give to students. Many teachers fall ill – either to seasonal illnesses due to weakened immunity, or to longer term illnesses exacerbated by toxic stress. A recent Times article painted a heartbreaking picture of what public school teachers endure in order to teach our nation’s most vulnerable children. Those who choose to teach in this environment are incredibly resilient, committed, caring, and high capacity people. I know I was. In moments of high intensity such as these, tensions around what it means to care for ourselves can increase. On the one hand, with our minds on systemic change, it can start to feel that we have even less time for self care. Our sense of self care can feel less important in this moment when we want to show up for the collective. In some ways, whatever inner resistance we carry towards caring for self can also gets an excuse to dominate – whether it’s about time, priorities or fear/guilt of being selfish, or something else. In the collective consciousness, we also have a hard time understanding how self care truly supports systemic change because we have long held cultural beliefs that self care is selfish, that it is only for the rich/privileged, or that it can wait for some ideal moment when life is easier. The truth is that when we are most stretched this is when we need to pay the closest attention to our self-embodiment and self-nurturement. These are the moments our bodies, minds, and hearts are likely crying out for even more support – from the strain of taking action, to the hurt associated with injustice, and the daily labor of holding it all while still showing up for our students and families. One helpful way to think about this is to imagine if it were not ourselves, rather a close friend or beloved person. If you saw a loved one in pain, how might you support them? What would you say? Would you push them to drive even harder in a moment of social and political stress or would you urge them to slow down, take good care and ensure they are staying committed to the most fundamental parts of their health such as sleep, nutrition and exercise? Most of us would urge a friend to take care of themselves in moments of crisis – and likewise we must give ourselves permission to use this wisdom within our own practice. 1) A radical act of reclaiming self-worth and value. If we are members of marginalized or oppressed groups, the act of caring for ourselves is an act of direct confrontation to hierarchical structures that say we do not matter. When we honor the vulnerability, wholeness, and sanctity of our own life, we reclaim our right to exist in world that denies this daily. 2) A rallying cry towards sustainability. Part of the contradiction inherent in social movements is that if we burn out too soon due to sheer size of the task – then we fail to see the benefits of our work. Part of how capitalist oppression functions is to keep us too busy to speak truth to power, too isolated to organize, too tired to entertain the notion of a better way. To demand that our social movements incorporate self-care from the bottom up is to begin the work of liberation now, not waiting for the far off moment when we are free “enough,” to make time for ourselves or act as if our very bodies matter. We resist hierarchical, heteropatriarchal white body supremacist notions of work, value and embodiment when we denounce the binary between social justice and self-care. Sure, we live in an era where self-care is being sold on every aisle, station and social media ad. It can feel like just another arm of the consumerist machine that tries to sell our pain back to us, keeping us numb, complacent and funding the system. What we must understand is that this is the very nature of capitalism itself – it must cannibalize in order to survive. Most things we engage within pop culture originated somewhere more authentic whether it is music, dance, or fashion. It would be a tremendous loss if we allow the bubble gum image of self-care to distract us from the very notion of self-care as a human right. We at the Teaching Well stand with teachers and we believe in teachers’ human right to be treated with dignity, respect and honor in our sacred profession. When we care for teachers, we invest in a better future for all young people.